We invite you to explore our site and learn more about our church and it's ministries. Our mission is to reach out to our community with the love of Jesus Christ, and to be a light of HOPE to all people. We are a family of faith, hope, and love and would like to invite you to experience God's love and peace in your life. 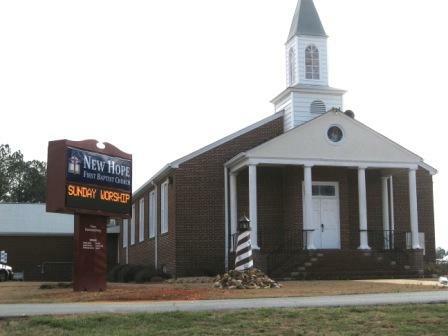 New Hope is a great place to worship with warm friendly people and to find your unique place to serve our awesome God. You'll feel right at home from the first time you attend. So, come on, come on home! Sunday School starts at 9:45 am Morning Worship at 11:00 am. Sunday Discipleship Studies at 6:00 pm.